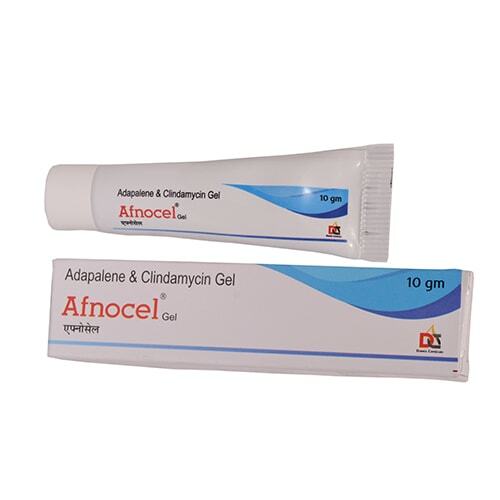 Afnocel | Adapalene 1 Mg + Clindamycin Phosphate 10 Mg + Methyl Paraben 1Mg + Phenoxyethanol 2.5Mg – Afnocel is an antiacne cream which consists of Adapalene 1 Mg + Clindamycin Phosphate 10 Mg + Methyl Paraben 1Mg + Phenoxyethanol 2.5Mg which is very effective for the treatment of Acne. Adapalene is used for the topical treatment of acne vulgaris whereas clindamycin Phosphate belongs to a group of drugs called lincosamide antibiotics, which slow or stop the growth of bacteria. Methyl Parabe is an anti-fungal agent used in the variety of skin treatments and cosmetic products. This product is very effective on hard, moist and pustular acne besides freckles as well as blotches. This cream is best for cystic acne, acne vulgaris, seborrhoea, simply acne, blackheads, comedones, whiteheads, papules,(pinheads), nodules (large papules), pustules (pimples), and possibly scarring.